The facet joint has been increasingly implicated as a potential source of lower back pain. Diagnosis can be challenging as there is not a direct correlation between facet joint disease and clinical or radiological features. 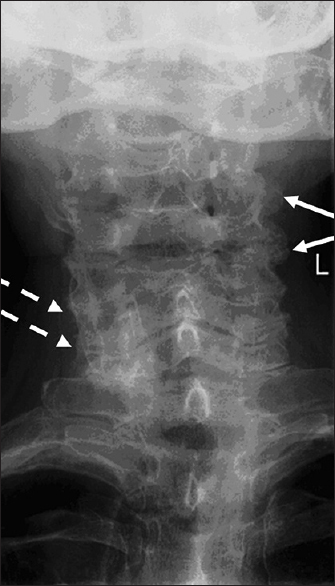 The purpose of this article is to review the diagnosis, treatment, and current imaging modality options in the context of degenerative facet joint disease. We describe each modality in turn with a pictorial review using current evidence. Newer hybrid imaging techniques such as single photon emission computed tomography/computed tomography (SPECT/CT) provide additional information relative to the historic gold standard magnetic resonance imaging. The diagnostic benefits of SPECT/CT include precise localization and characterization of spinal lesions and improved diagnosis for lower back pain. It may have a role in selecting patients for local therapeutic injections, as well as guiding their location with increased precision. 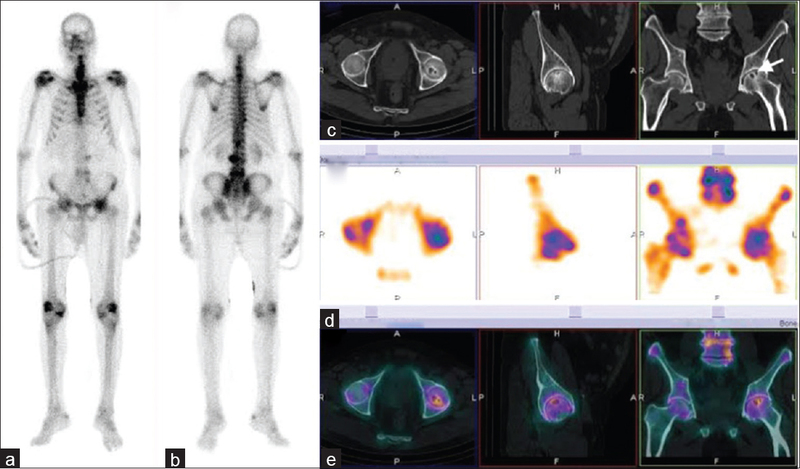 Purpose: The aim of the present study is to evaluate the possible role of fluorine-18 fluorodeoxyglucose positron emission tomography-computed tomography ( 18 F-FDG PET-CT) in the management of mycosis fungoides (MF). Materials and Methods: Nineteen patients (mean age, 40.6 years; median age 41 years; 16 males and 3 females) with risk of secondary lymph node (LN) involvement (those with large cell transformation, tumors, erythroderma, or enlarged LNs on physical examination) were included in the study. All patients underwent PET-CT scan by injecting 0.06 mCi/kg of F18 FDG. The maximum standard uptake value (SUVmax) was recorded for each patient. Results: The 18 F-FDG PET-CT was positive in 15 patients. 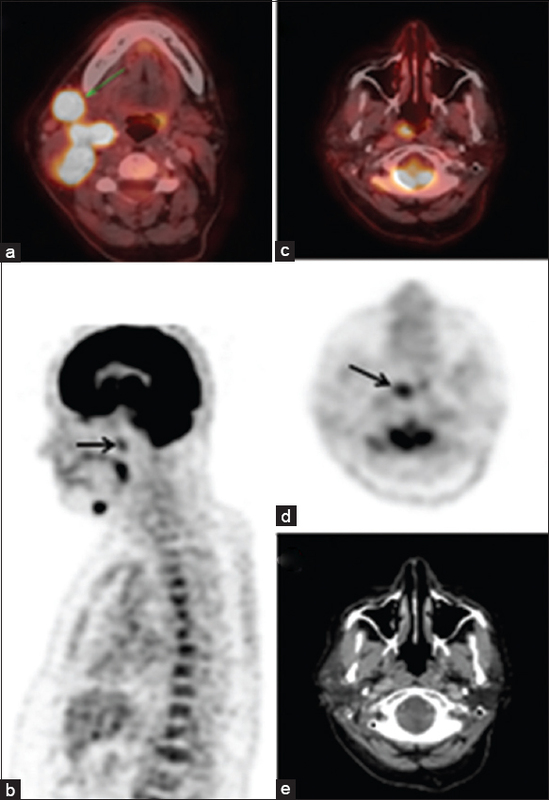 PET-CT detected local cutaneous disease in 13 cases. The range of SUVmax is 2.8-14.1. Out of 19 patients, hypermetabolic adenopathy is found in 9 patients and visceral involvement in one. Conclusions: Although the study population is small our findings suggests that 18 F-FDG PET-CT can detect cutaneous and extracutaneous lesions in MF and may guide biopsies especially in patients with risk of secondary LN involvement. 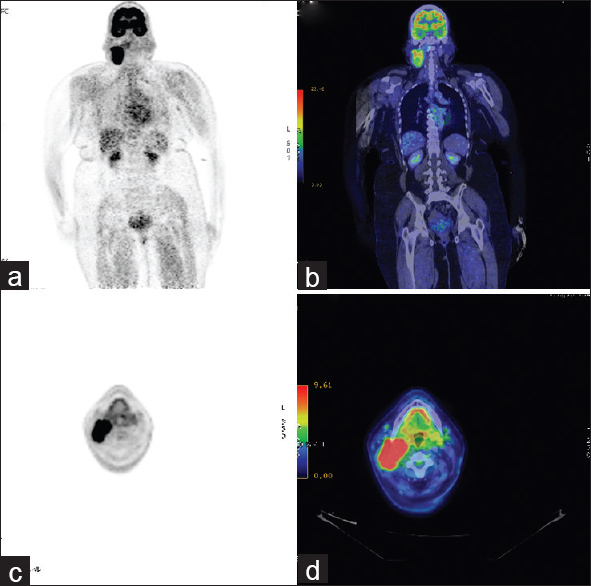 Purpose of the Study: The present study was undertaken to evaluate the diagnostic utility of fluorine-18 fluorodeoxyglucose positron emission tomography/computed tomography (F-18 FDG PET/CT) in patients presenting as pyrexia of unknown origin (PUO). Materials and Methods: Forty-seven patients (31 males and 16 females; mean age of 42.7 ± 19.96 years) presenting as PUO to the Department of Medicine at the All India Institute of Medical Sciences, New Delhi over a period of 2 years underwent F-18 FDG PET/CT. PET ⁄ CT was considered supportive when its results correlated with the final definitive diagnosis. Final diagnosis was made on the basis of combined evaluation of history, clinical findings, investigations, and response to treatment. Results: Thirty-five PET/CT studies (74.5%) were positive. However, only 18 (38.3%) were supportive of the final diagnosis. In three patients (6.4%), PET/CT was considered diagnostic as none of the other investigations including contrast-enhanced computed tomography of chest and abdomen, and directed tissue sampling could lead to the final diagnosis. All these three patients were diagnosed as aortoarteritis. Conclusion: Fluorine-18 fluorodeoxyglucose positron emission tomography/computed tomography is an important emerging modality in the workup of PUO. It supported the final diagnosis in 38% of our patients and was diagnostic in 6.4% of patients. Thus, PET/CT should only be considered as second-line investigation for the diagnostic evaluation of PUO; especially in suspected noninfectious inflammatory disorders. 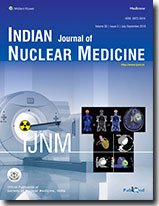 Background: To evaluate the advantages of contrast enhanced F-18-fluorodeoxyglucose (FDG) positron emission tomography-computed tomography (PET-contrast enhanced CT [CECT]) when used as an initial imaging modality in patients presenting with metastatic malignancy of undefined primary origin (MUO). Materials and Methods: A total of 243 patients with fine needle aspiration cytology/biopsy proven MUO were included in this prospective study. Patients who were thoroughly evaluated for primary or primary tumor was detected by any other investigation were excluded from the analysis. Totally, 163 patients with pathological diagnosis of malignancy but no apparent sites of the primary tumor were finally selected for analysis. The site of probable primary malignancy suggested by PET-CECT was confirmed by biopsy/follow-up. Results: PET-CECT suggested probable site of primary in 128/163 (78.52%) patients. In 30/35 remaining patients, primary tumor was not detected even after extensive work-up. In 5 patients, where PET-CECT was negative, primary was found on further extensive investigations or follow-up. The sensitivity, specificity, positive predictive value and negative predictive value of the study were 95.76%, 66.67%, 88.28% and 85.71% respectively. Conclusions: F-18 FDG PET-CECT aptly serves the purpose of initial imaging modality owing to high sensitivity, negative and positive predictive value. PET-CECT not only surveys the whole body for the primary malignancy but also stages the disease accurately. Use of contrast improves the diagnostic utility of modality as well as help in staging of the primary tumor. 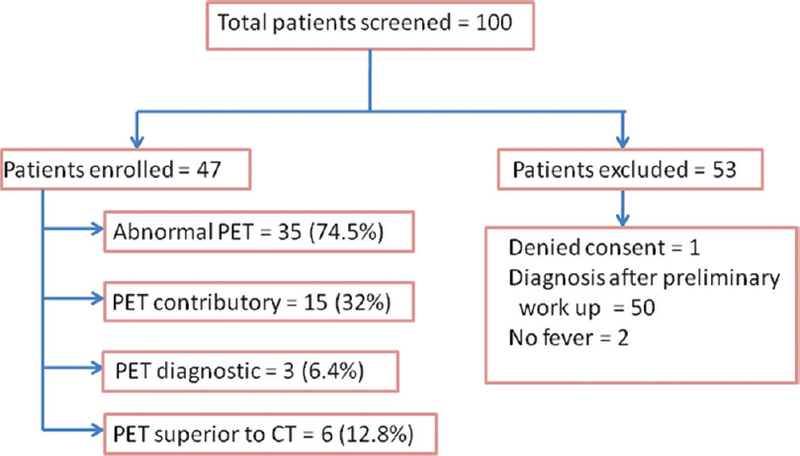 Although benefits of using PET-CECT as initial diagnostic modality are obvious from this study, there is a need for a larger study comparing conventional methods for diagnosing primary in patients with MUO versus PET-CECT. Objectives: The study was performed to evaluate the incremental value of single photon emission computed tomography/computed tomography (SPECT/CT) over planar radioiodine imaging before radioiodine ablation in the staging, management and stratification of risk of recurrence (ROR) in differentiated thyroid cancer (DTC) patients. Materials and Methods: Totally, 83 patients (21 male, 62 female) aged 17-75 (mean 39.9) years with DTC were included consecutively in this prospective study. They underwent postthyroidectomy planar and SPECT/CT scans after oral administration of 37-114 MBq iodine-131 (I-131). The scans were interpreted as positive, negative or suspicious for tracer uptake in the thyroid bed, cervical lymph nodes and sites outside the neck. In each case, the findings on planar images were recorded first, without knowledge of SPECT/CT findings. Operative and pathological findings were used for postsurgical tumor-node-metastasis staging. The tumor staging was reassessed after each of these two scans. 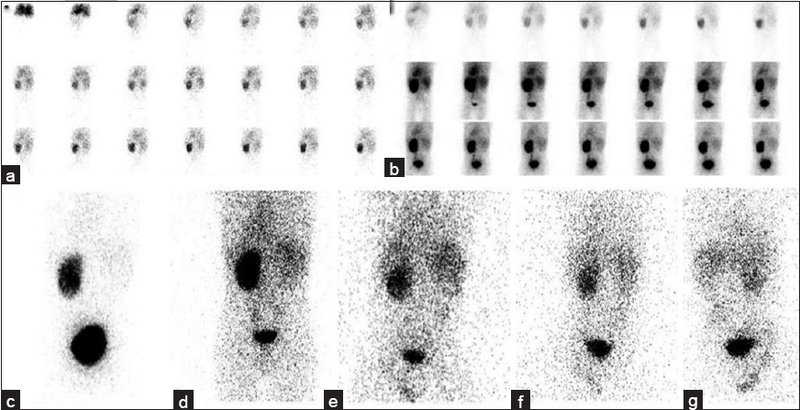 Results: Single photon emission computed tomography/computed tomography localized radioiodine uptake in the thyroid bed in 9/83 (10.8%) patients, neck nodes in 24/83 (28.9%) patients and distant metastases in 8/83 (9.6%) patients in addition to the planar study. Staging was changed in 8/83 (9.6%), ROR in 11/83 (13.2%) and management in 26/83 (31.3%) patients by the pretherapy SPECT/CT in comparison to planar imaging. SPECT/CT had incremental value in 32/83 patients (38.5%) over the planar scan. Conclusion: Single photon emission computed tomography/computed tomography is feasible during a diagnostic I-131 scan with a low amount of radiotracer. It improved the interpretation of pretherapy I-131 scintigraphy and changed the staging and subsequent patient management. Objective: The aim of the study was to study the clinical profile in patients of differentiated thyroid cancer (DTC) with Iodine-131 avid distant metastasis at presentation. The study also attempted to evaluate factors influencing survival among these patients. Material and Methods: The cohort includes 35 patients (26 Female, 9 Male) studied retrospectively and prospectively over a period of 5 years at the Sher-I-Kashmir Institute of Medical Sciences, Srinagar, India. Results: The five years cause specific survival among patients of DTC with distant metastasis in the study group was 74.3%. The mean age at presentation was 41.4 years with female patients outnumbering the male patients in a ratio of 5:1.Papillary histopathology was the commonest in 65.7% followed by Follicular in 31.4% and poorly differentiated cancer in 2.9% of patients.31.4% 0f patients presented with relatively advanced AJC/UICC tumor stage of T3-T4. Bone was the commonest site of metastasis in 42.85% of patients followed by lung in 40% 0f patients. 82.9% of patients had only single organ metastasis. Therapeutic Radioiodine was administered in 31 (88.6%) patients. On univariate analysis of various factors that may be influencing the cause specific survival at 5 years, age ≥ 45 years, T3-T4 tumor stage, regional lymph node metastasis, follicular histopathology and non administration of radioiodine revealed significant (P<0.05) association with a poor 5 year survival. However multivariate analysis identified advanced tumor stage (T3-T4) and non administration of radioiodine to be the only independent factors associated with poor survival. Conclusion: Patients of differentiated thyroid cancer with distant metastasis having advanced tumor stage (T3-T4) and those in whom therapeutic radioiodine (I-131) is not administered seem to have an unfavorable prognosis in terms of a 5 years cause specific survival. Objectives: Coronary artery disease is the leading cause of mortality worldwide. The goal of this study is to determine the prognostic value of semiquantitative parameters of electrocardiogram-gated single photon emission computed tomography (SPECT) myocardial perfusion imaging (MPI) in a large Middle Eastern (Iranian) population. Materials and Methods: This study was a prospective study including all patients referred to our center for myocardial perfusion scan. The patients were followed annually up to 24 months and their survival information was collected. Results: From 1148 patients, 473 (41.2%) men and 675 (58.8%) women, 40.6% had normal MPI, 13.3% near normal and 46.1% abnormal MPI. After follow-up of 929 patients, 97.4% of patients were alive, and 2.6% succumbed to cardiac deaths. Abnormal ejection fraction was related with cardiac events (P = 0.001), but neither transient ischemic dilation (TID) (P = 0.09) nor lung/heart ratio (P = 0.92) showed such relationship. Association between summed difference score (SDS) and soft cardiac events (P < 0.001) was significant. Summed motion score (SMS) and summed thickening score (STS) showed a significant relation with hard cardiac events, including myocardial infarction and cardiac death (P < 0.001 and P = 0.001, respectively). 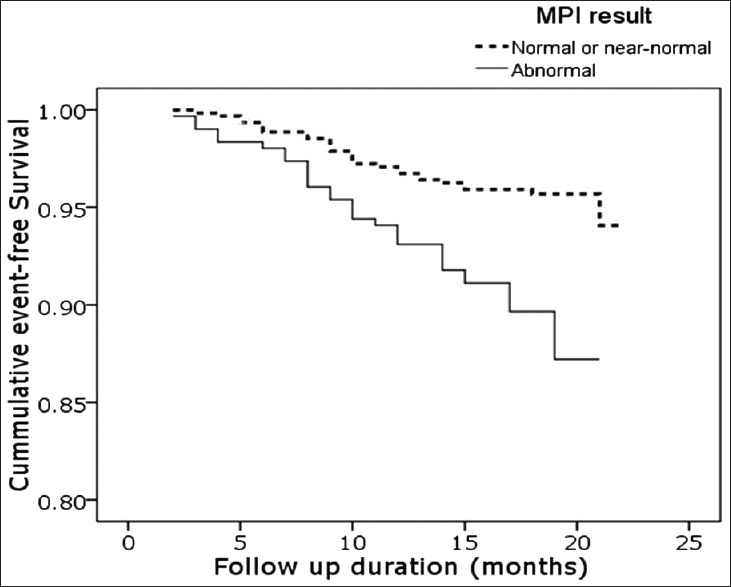 Totally, risk of all cardiac events was significantly higher in abnormal MPI group than normal group (P < 0.001, 0.02, and 0.025, respectively). No significant relationship was found between TID and total cardiac events (P = 0.478). Conclusion: Semiquantitative variables derived from gated SPECT MPI have independent prognostic value. Rate of total cardiac events is higher in patients with higher summed stress score and SDS. Total and hard cardiac events are higher in upper scores of functional parameters (SMS and STS). Total cardiac events are higher in patients with lower left ventricular ejection fraction. Purpose: Estimation of Compton attenuation and the photoelectric absorption coefficients were explored at various depths. Methods: A new method was proposed for estimating the depth based on the convolution of two exponential functions, namely convolution of scattering and primary functions (CSPF), which the convolved result will conform to the photopeak region of energy spectrum with the variable energy-window widths (EWWs) and a theory on the scattering cross-section. 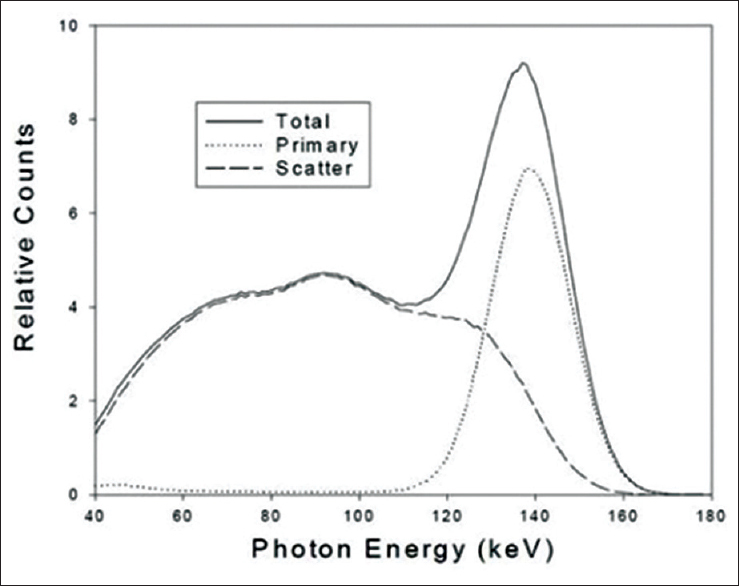 The triple energy-windows (TEW) and extended triple energy-windows scatter correction (ETEW) methods were used to estimate the scattered and primary photons according to the energy spectra at various depths due to a better performance than the other methods in nuclear medicine. For this purpose, the energy spectra were employed, and a distinct phantom along with a technetium-99 m source was simulated by Monte Carlo method. Results: The simulated results indicate that the EWW, used to calculate the scattered and primary counts in terms of the integral operators on the functions, was proportional to the depth as an exponential function. The depth will be calculated by the combination of either TEW or ETEW and proposed method resulting in the distinct energy-window. The EWWs for primary photons were in good agreement with those of scattered photons at the same as depths. The average errors between these windows for both methods TEW, and ETEW were 7.25% and 6.03% at different depths, respectively. The EWW value for functions of scattered and primary photons was reduced by increasing the depth in the CSPF method. Conclusions: This coefficient may be an index for the scattering cross-section. Parapharyngeal space (PPS) tumors are rare and account for about 0.5% of all head and neck neoplasms. Most PPS tumors are benign (up to 80%) while the remaining 20% are malignant. These tumors are either primaries; most commonly arising from salivary glands or metastatic tumors or due to direct extension of tumors from the adjacent sites. Distant metastasis from breast cancers more commonly involves the lungs, bones, brain and liver. Metastasis to the PPS from a primary breast carcinoma is rare, with only one case reported in literature. We, to the best of our knowledge report the second case of a carcinoma breast metastasizing to the PPS and further discuss the diagnostic and therapeutic challenges involved in its management. 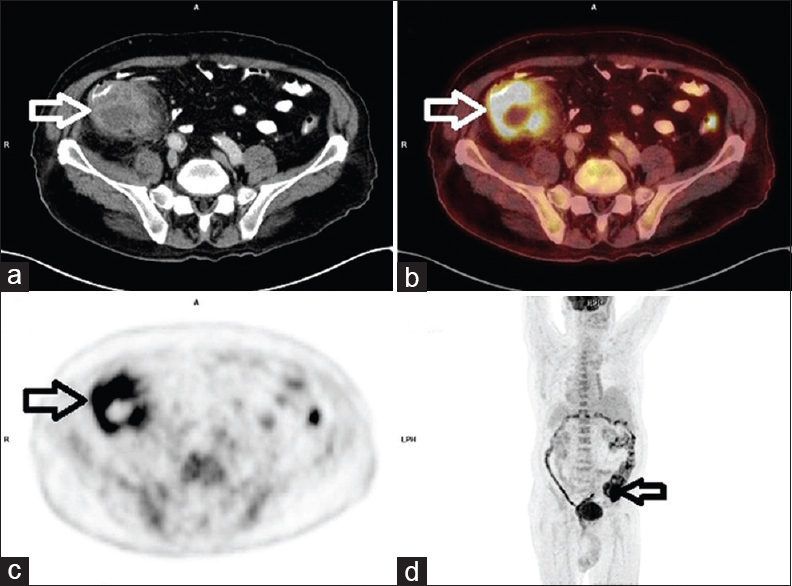 A fluorine-18 fluorodeoxyglucose positron emission tomography/computed tomography scan apart from explicitly defining the extent of the PPS tumor, majorly influenced the therapeutic decision making process by ruling out other sites of metastasis. Hypertrophic pulmonary osteoarthropathy (HPOA) is not an uncommon paraneoplastic syndrome that is frequently associated with lung cancer. 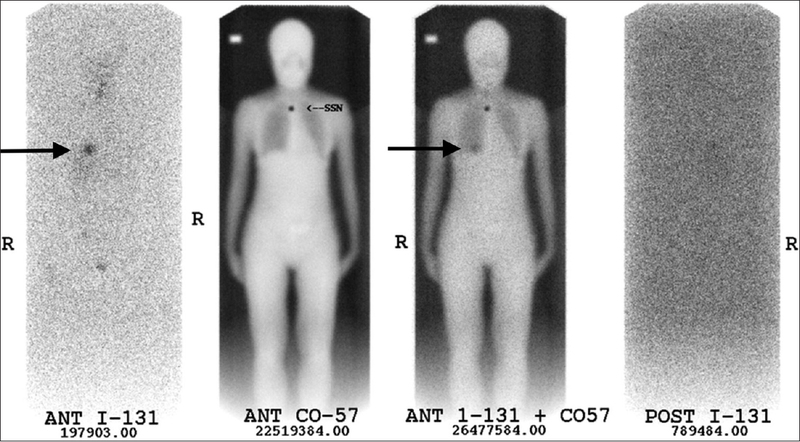 A 54-year-old male patient with lung adenocarcinoma underwent bone scintigraphy and fluorodeoxyglucose (FDG) positron emission tomography/computed tomography (PET/CT) scanning for initial staging. 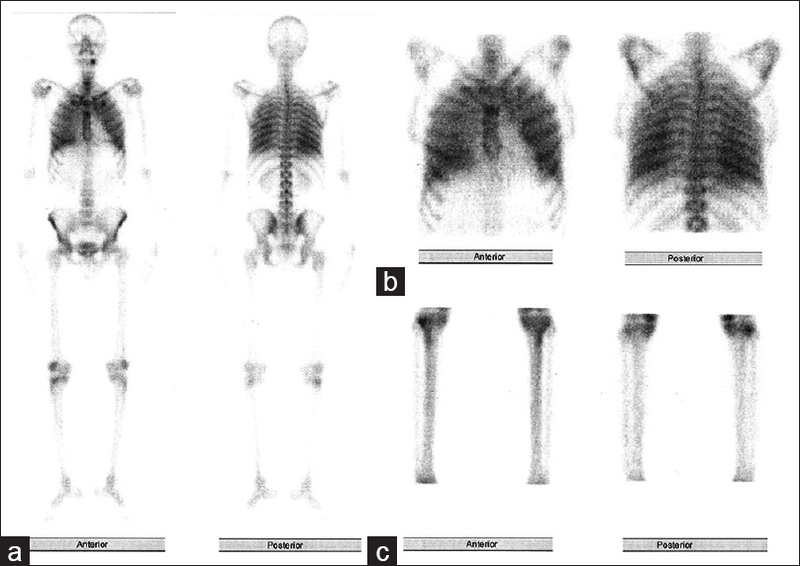 Bone scintigraphy revealed increased periosteal activity in lower extremities. FDG PET/CT revealed hypermetabolic right lung mass, mediastinal lymph nodes, and mildly increased periosteal FDG uptake in both femurs and tibias. 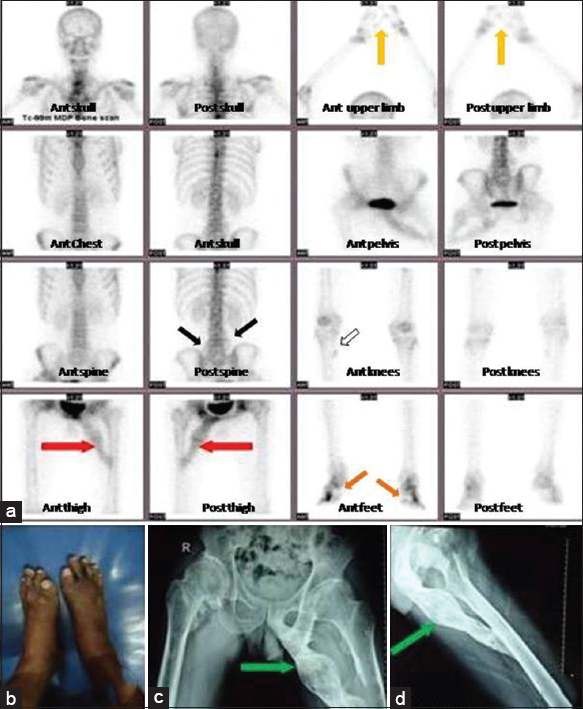 The findings in lower extremities on bone scan and FDG PET/CT were interpreted as HPOA. Natural killer/T-cell (NK/T-cell) lymphoma is a rare condition, which presents as necrotic, granulomatous lesions involving the nose and the upper respiratory tract. The condition usually has an aggressive clinical course. The predominant subtype of NK/T-cell lymphoma noted in Asian population is the nasal type. We describe a case of biopsy-proven NK/T-cell lymphoma with bilateral adrenal involvement. Adrenal involvement by lymphoma is usually of B-cell type and occurs in disseminated disease and often unilateral. Bilateral adrenal involvement by T-cell lymphoma is extremely rare. 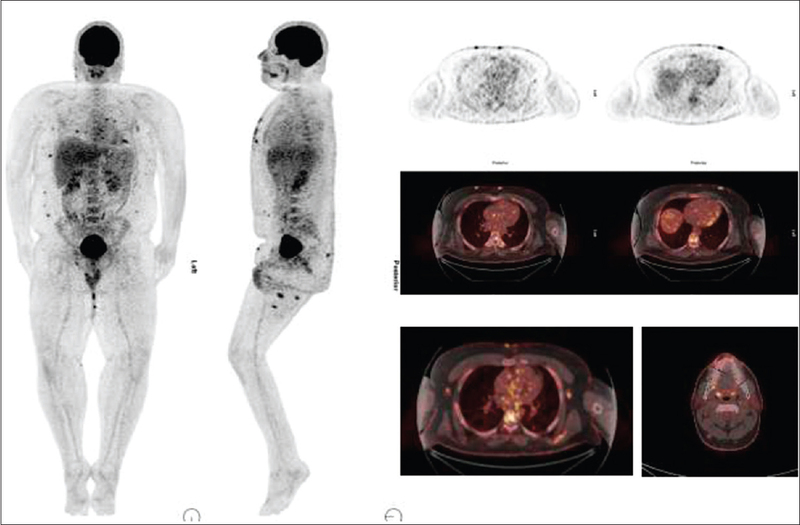 In recent years, flourodeoxyglucose-positron emission tomography/computed tomography (FDG PET/CT) has been used intensively in the field of oncology. However, an increase in FDG uptake has been observed both in malignant tissues, and inflammatory processes. Therefore false-positive results have appeared. We present a 70-year-old male patient who presented to the hospital with right lower quadrant pain. A right lower quadrant mass was observed with conventional methods, and PET/CT was performed which revealed a hypermetabolic mass in the right lower quadrant. The patient was referred to the surgery with a suspect malignant mass whose histopathological report indicated plastron appendicitis. Although FDG PET/CT is a reliable method in the evaluation of oncological cases, false-positivities should be taken into consideration in inflammatory processes. Total knee arthroplasty has witnessed a significant increase in recent years. Despite the advantages of this surgical procedure, it has some complications, the most serious of which is prosthetic infection. The discrimination of bacterial infections from sterile inflammatory processes is of great importance in the management of periprosthetic infection (PPI). Ubiquicidin (UBI) is a synthetic antimicrobial peptide fragment reported to be highly infection-specific. Tc99m-UBI has recently been reported to be a promising radiotracer for infection imaging. We report a case of left knee PPI diagnosed using 99mTc-UBI scintigraphy and compared with F-18 fluorodeoxy-glucose positron emission tomography. Primary hyperparathyroidism is the first differential diagnosis when a patient presents with asymptomatic hypercalcemia. The symptoms of hyperparathyroidism can be as grave as skeletal, cardiovascular, and neuropsychological changes. Skeletal manifestations are relatively common, and patient may present with generalized or focal bone pains, fragility fractures, subperiosteal bone resorption, and osteolytic lesions like brown tumors and salt and pepper appearance of the skull. However, focal osteosclerotic lesions of the skull are rare findings in hyperparathyroidism. Only a few cases of associated osteosclerosis are reported in the literature. Here, we report a case of Tc99m SestaMIBI positive parathyroid adenoma with coexisting osteolytic and osteosclerotic skull lesions on Tc99m methylene diphosphonate bone scan. A 33 years old female patient with chronic renal transplant rejection proved by MAG3, ultrasound and graft biopsy presented with abdominal pain and fever. Part of her work up included gallium-67 scan which revealed diffuse abnormal graft uptake with multifocal areas of marked uptake. Findings were interpreted as acute lobar nephronia. Repeat gallium scan two weeks after intravenous antibiotic therapy showed significant response reflected by resolution of most of focal areas of increased uptake which was parallel to clinical improvement. A 71-year-old male patient with solitary pulmonary nodule underwent fluorodeoxyglucose positron emission tomography/computed tomography (FDG PET/CT) showing slightly increased FDG uptake in this nodule. In addition, PET/CT detected hypermetabolic sclerotic bone lesions in the right second rib and 7 th thoracic vertebrae, which were interpreted as possible metastases, and mildly increased FDG uptake in the prostate gland highly suspicious of malignancy. The patient's prostate-specific antigen (PSA) level was within normal range (3.8 ng/dL). The histopathological examination of the lung nodule and right second rib lesion proved metastases from prostate cancer, then the prostate biopsy-confirmed prostate adenocarcinoma. 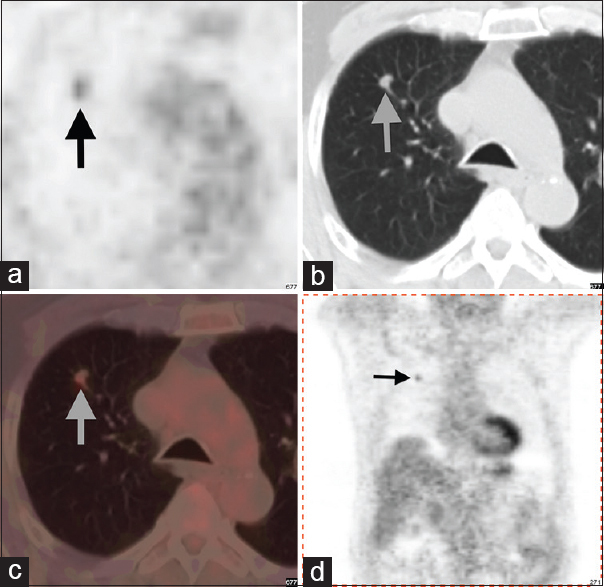 The unique feature of this case is to emphasize the importance of performing PET/CT for solitary pulmonary nodule in detecting PSA-negative metastatic prostate cancer. This case indicated that it should be kept in mind that, even if the PSA is negative, a lung metastasis of prostate cancer may be an underlying cause in patients evaluated for solitary pulmonary nodule by FDG PET/CT. We present a case of 3-year-old boy who was incidentally diagnosed to have single left kidney on ultrasonography. Dynamic technetium-99m ethylenedicysteine renal scintigraphy was acquired for assessing the existing kidney function showed the tracer localization in bilateral renal fossae during the entire study. 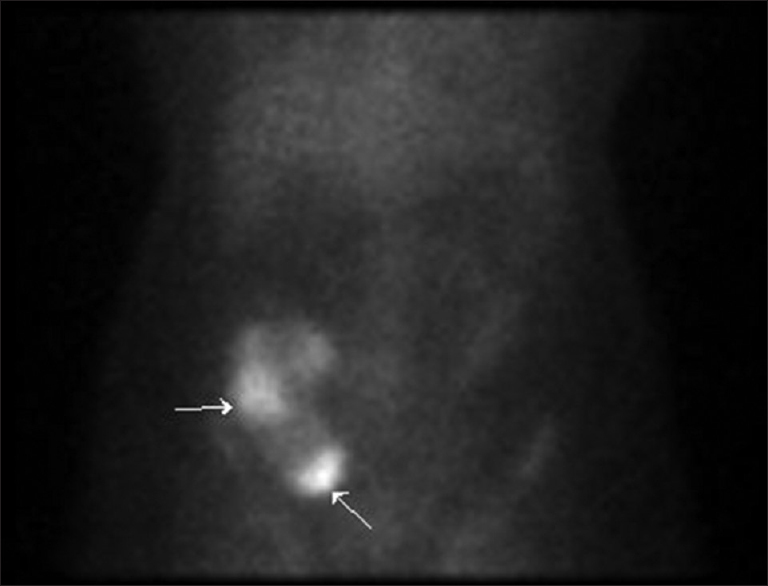 The single-photon emission computerized tomography/computerized tomography study revealed activity in the right renal fossa to be in the enlarged right lobe of the liver, which was mimicking as impaired functioning right kidney in planar images. The hybrid imaging helped in accurate delineation of tracer uptake by confirming it to be the false appearance of the right kidney in planar imaging. This case report also highlights the possible mechanism of renal tracer uptake in the liver parenchyma. Pulmonary calcification is a subdiagnosed metabolic lung disease that is commonly asymptomatic and frequently associated with end-stage renal disease. We report a case of a 21-year-old man with a 4-year history of end-stage renal disease without respiratory symptoms. We discover incidentally on a bone scan a pulmonary calcification. Parathyroidectomy was refused by the patient. After 3 months of medical treatment, a second bone scan was done, and we found a partial response. Pulmonary alveolar microlithiasis (PAM) is a rare diffuse pulmonary disease representing microliths formed by deposition of calcium phosphonate in the alveolar airspaces. PAM is often diagnosed incidentally during chest X-ray imaging. Most of them are asymptomatic. We present a 39-year-old man referring for a bone scan due to a complaint of right leg pain. Bone scan showed diffuse uptake of bone-seeking radiotracer on both lung fields predominantly in basal regions. The bronchoalveolar lavage test confirmed the diagnosis of PAM. Osteo-cutaneous flap are commonly used for reconstruction of bone defect after oncology surgery. The success of surgery depends on the viability of the bone flap. 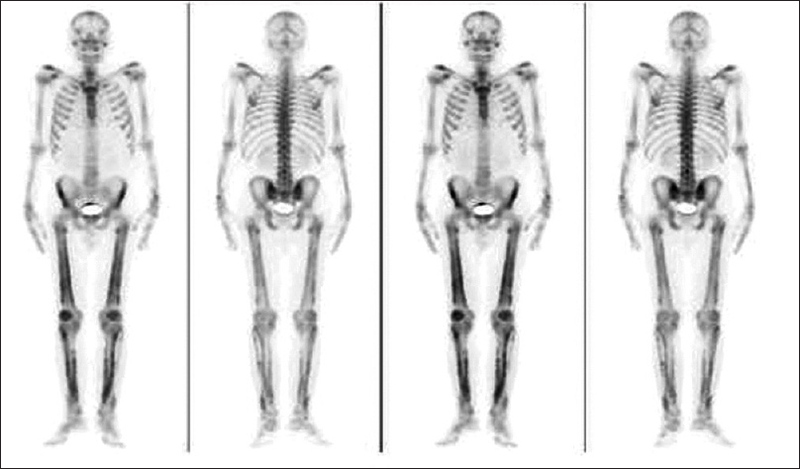 Bone scan is a known, but less performed method, to look for viability of bone flaps. We describe a case of 50-year-old lady, presenting with squamous cell carcinoma of left buccal mucosa (cT4N1M0) involving the skin and mandible. She underwent left segmental mandibulectomy and upper alveolectomy with neck dissection, followed by reconstruction using a fibular osteo-cutaneous flap and anterolateral thigh free flap. On postoperative day 10, the intraoral flap showed signs of nonviability. 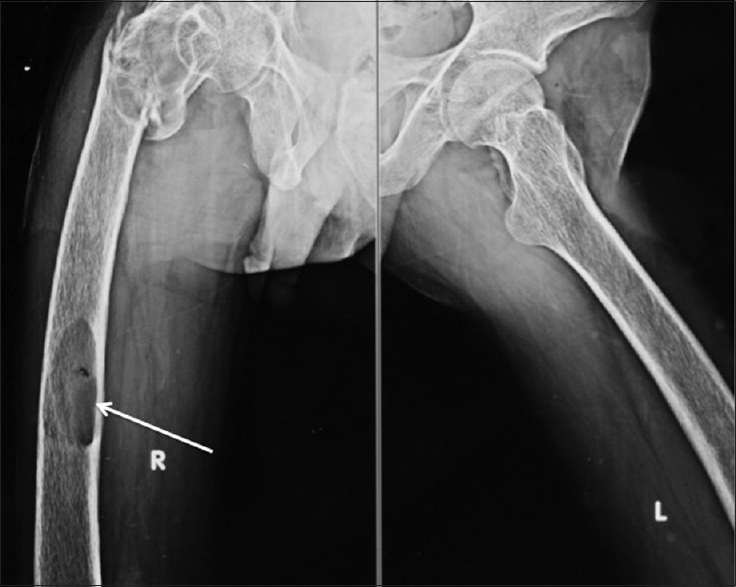 The patient was sent to nuclear medicine for assessment of viability of the free fibula flap. 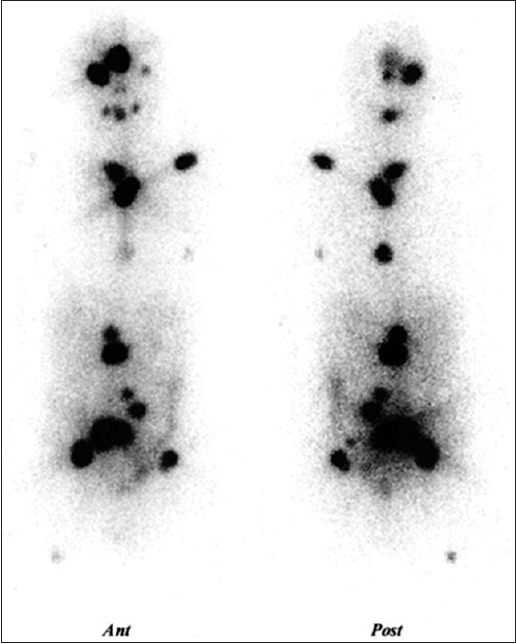 The patient underwent three phase 99m Tc-methylene diphosphonate (MDP) bone scan and single-photon emission computerized tomography. Computerized tomography showing good tracer uptake in fibula confirming viability. 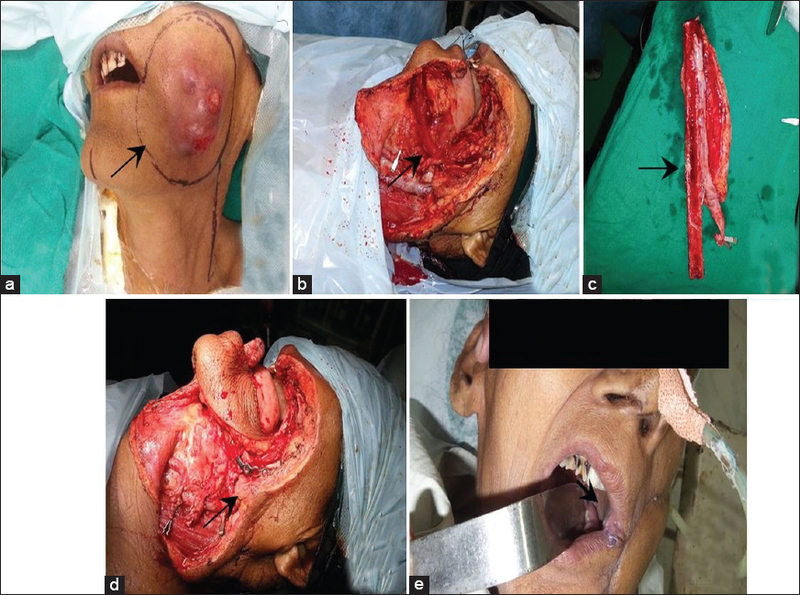 The case reflects the use of 99m Tc-MDP in viability assessment of the bone flap. Thyroglobulin (Tg) is frequently measured in follow-up of patients with differentiated thyroid carcinoma. A low stimulated Tg level (<1 ng/ml) associated with normal neck ultrasonography is considered as the most reliable criteria for complete remission in low risk patients. We are reporting a case of pediatric thyroid cancer with diffuse skeletal metastasis associated with low serum Tg level bringing a point of caution in evaluation of patients with low Tg. 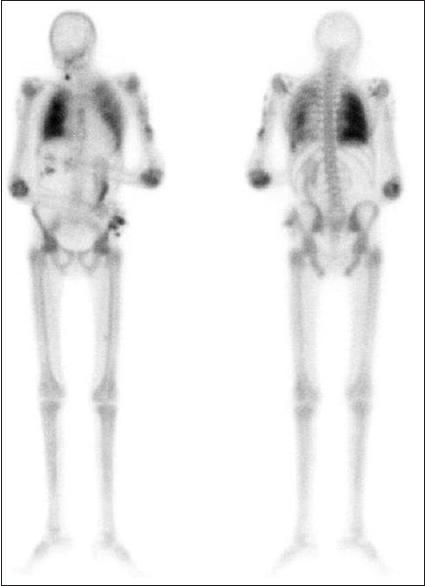 Excessive skeletal radioisotope uptake in relation to soft tissues along with absent or faint activity in the genitourinary tract on bone scintigraphy (BS) is known as a "superscan." However the association of pediatric solid tumor malignancy with metastatic superscan has not been reported previously. We here describe two such cases of neuroblastoma who presented with metastatic superscan on 99m Tc-methylene diphosphonate BS. Presence of a superscan usually indicates an advanced stage of the disease. The patient prognosis is usually poor. Though extremely rare superscan can be associated with pediatric solid tumor malignancies and should be kept in mind while reporting such cases. We present a 71-year-old male patient subjected to skeletal scintigraphy for metastasis work up of prostate cancer. Whole body planar images revealed a solitary focal tracer uptake in left femoral head mimicking as solitary metastatic focus. Single positron emission computed tomography/computed tomography images localized this increased tracer uptake to the subchondral cysts with minimal sclerosis in left femur head with no decrease in size of femur head and was reported as (degenerative joint disease). 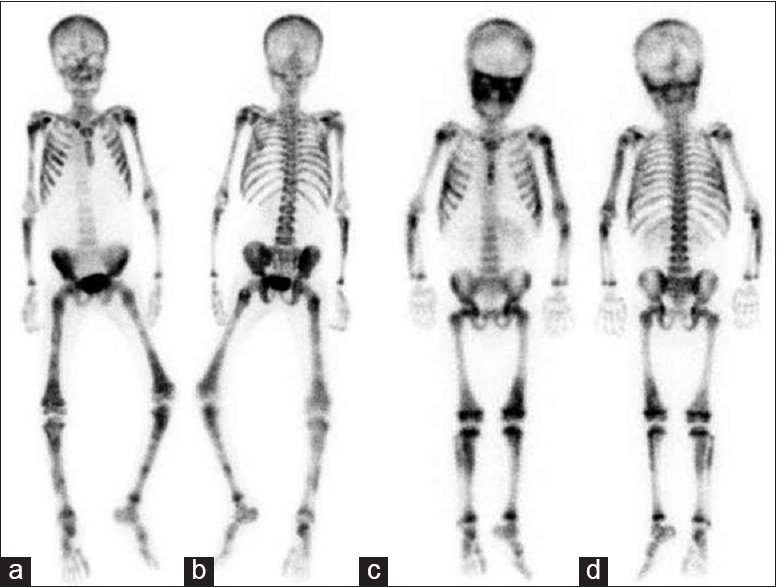 Fibrodysplasia ossificans progressiva is a rare disorder progressing to ossification of tissues causing disability. We report a case of father and daughter in a family presenting with this condition. The diagnosis was made with X-rays. However, Technetium-99m Methylene Diphosphonate bone scan showed extensive extra-osseous localization of tracer suggesting ossification of multiple ligaments, tendons, muscles and connective tissue. We report a 37-year-old female who underwent radioiodine treatment, with subsequent scintigraphy findings suggestive of pulmonary metastatic disease. The abnormal uptake on single-photon emission computed tomography/computed tomography correlated with a focal area of the right middle lobe bronchiectasis.